At this point, the rest of your "Main Navigation” should be completed and all the pages you wanted to see in your site main menu are there. What next? We’re now going to add pages that do not appear in the site main menu, as well as linking your pages to each other! We want to make sure each page always leads to another. You might need to create additional pages that do not go in your site main menu. For instance, imagine you have designed a specific webpage that is only accessible via a URL located on your homepage (such as FAQ's, a blog post, or something similar). This is what the "Not Linked" section is best for! These pages of your website can all be accessible to visitors, but only through its URL (meaning it will not appear in any predetermined Squarespace menu). A great example of this is a Services page. On the Services page, you might list all of the packages or services that you offer. You might extend each introduction of a service to lead into a button or hyperlink that leads a visitor to a FAQ page. You can do this by creating that new page and linking the two together. Under "Not Linked", select "+"
On the content clocks menu, select "Page". Under "Page Title", name it FAQs. Under "Starter Layout", select "Details" and go with Details 1. Select "Save" in the top left hand corner. You will see this new page under the "Not Linked" section! Hover your mouse over the FAQs page under you main menu and select “Settings” next to the FAQs page. The “Navigation Title” and “Page Title” will read FAQs. You can leave that as is. The URL Slug reads "/faqs". Remember this as you will need this URL Slug to serve as the link on your other page. Select "Save" in the bottom right hand corner. Remember that if you want to modify this page after this module, don't forget to change the “Navigation Title”, “Page Title” and “URL Slug”. Now let's link this page using a button under our Main Navigation. Choose any page you'd want to see your FAQ button. If you don't want this option, feel free to remove it after this module is complete. 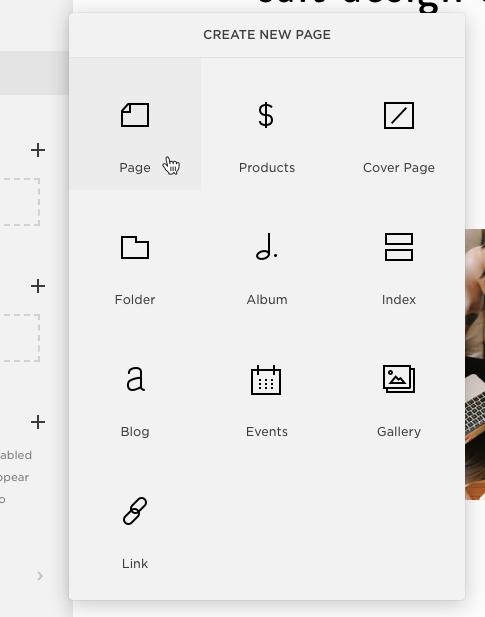 Select the page you want to work on and make sure it's in the editable stage. Find out where you want to place your FAQs button and select the grey tab. Select "Button". Under "Text", name it FAQs. 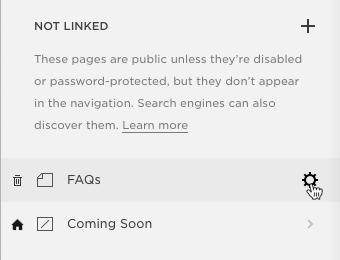 Select "Clickthrough URL", select "Content" and scroll down until you see the FAQs page, which is the page you created in Step 1 in the “Not Linked” section. Notice when you select it, you will see "/faqs" show up in the dark grey bar. Click "Apply" in the bottom right hand corner. There is now a button on this page that links to the FAQs page! The look of the button can be modified in "Style Styles", which we will cover in a future module. Want to remove the button? Like all content blocks in Squarespace, hover your curser in the content block you want to delete. A little trash can will appear in the top grey banner. Just click on that and the content block will be no more. Let’s create another link, this time with text. Again, you will need to figure out which page you'd like this link to be on. Because this will link to actual text, you may need to write additional copy. For example: For Frequently Asked Questions, click here!" Using your mouse, highlight those words you want to act as your link. In this case, the words "click here" will serve as the link. In the text editor bar, select the links icon. An additional window will pop up. Select "Content" and select the FAQs page you created under the “Not Linked” section. You will see the words underlined now. Want to remove the link? Hover your mouse over the linked text and select. From there, you can either select “Remove” or “Edit”. Again, if you don't want to keep the button or link on your site, feel free to trash it. This lesson is just to demonstrate you how you would utilize the "Not Linked" section. Great job! Module 3 is done! Now let’s move on to Module 4, where we’ll learn the basics of design!